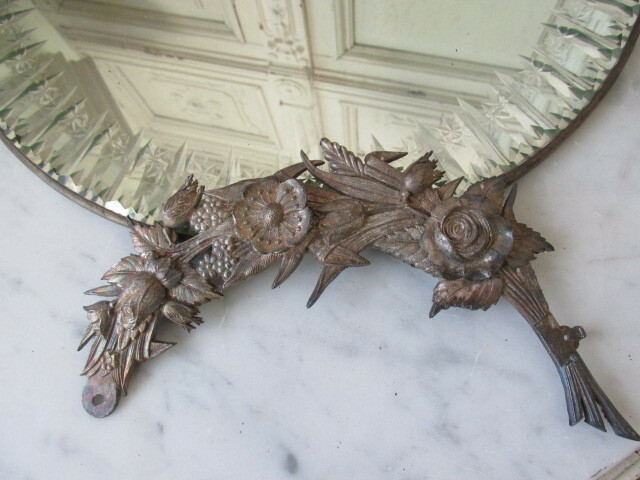 THIS IS A FABULOUS LITTLE OLD ANTIQUE 8" LONG METAL DETAIL PIECE WITH A ROSE, FLOWERS AND A BOW THAT IS DATED 1883. This is an older piece of very good quality. The back is stamped Patent Jan 9, 1883 and the company name, which I can't make out.It is curved with a bow on one end and very detailed flowers and a rose, and leaves all over it. It has the original finish with some wear and discoloration. Measurements are about 8 1/4" by 2 1/2" . It weighs about 1/2 pound.